gamerisms introduces an overview of newer slot machines 2017 for the fourth year in a row. This yearly report previews the slot machines 2017 as presented at G2E in Las Vegas. This report describes for slot players, the new slot games, upgrades and internet connection of these innovative slot makers: Aristocrat, Bally/WMS/Scientific Games, IGT/Gtech and Konami. We begin with IGT/GTech who has expanded its premium portfolio with the introduction of new cabinets and more than two dozen new premium game themes. IGT's CrystalCurve ultra cabinet features a 32-inch, curved landscape touch screen display that is topped with a 50-inch, curved portrait display. Marquee titles include: The Ellen DeGeneres Show Sharing the Love Video Slots and The Goonies Video Slots. IGT reveals the debut of CrystalDual+ Stepper cabinet with game themes such as Gentlemen Prefer Blondes Slots, How to Marry a Millionaire Slots, and IGT heritage themes Top Dollar Premium Slots and Megabucks Double Gold Slots. Celebrating the 20th anniversary of Wheel of Fortune slots is the introduction of new game themes like Wheel of Fortune Double Times Pay 3x4x5x 3D game. Also, there is Wheel of Fortune Gold Spin Double Diamond Slots. Other slot machines 2017 include: Wheel of Fortune Gold Spin Triple Red Hot 7s and Wheel of Fortune Wheel Across America – California Coast multi-level progressive. They will continue to expand its library of True 3D titles like ZUMA 3D game featuring seven "must-hit by" progressives; the Jurassic World 3D game full of gripping cinematic 3D content, the Treasures of Olympus 3D game inspired by the legacy title Icarus The Journey, and The Baywatch 3d game which brings some of TV's most iconic beach scenes to life in a 3D gaming environment. 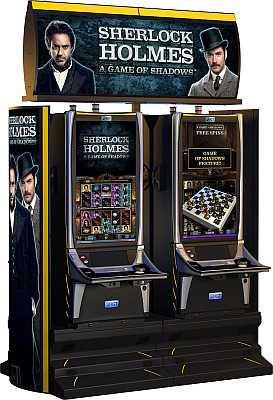 Several of pop culture's hottest themes will boast stunning visuals on its 42" vertical touchscreen display, as with Charlie's Angels Video Slots and Rubik's Slots plus Sherlock Holmes: A Game of Shadows plus a new theme for the omni-channel Powerbucks game family, Arctic Gems Slots. Additionally, there is the new Lucky's Quest omni-channel skill-based game, a for-wager, casual-style game that features a map-based progression narrative starring a dragon named Lucky. Players can unlock characters, win credits and advance to new levels based on performance in the title's symbol-matching game. A player's progress can be transferred across devices and channels with these new slot machines 2017. Players from across both channels can compete in real time for progressive payouts. IGT will expand its Video Reel Edge (VRE) family by introducing the Little Fish Big Fish, Beasties' Bonanza, and Cleopatra Pinball games. Each of these slot machines 2017 gives players the option to engage in either a free games bonus event, or a skill-based bonus event where player performance influences the bonus reward. Hallmark titles on the CrystalDual cabinet include Valley of Gold featuring a "must-hit by" mystery progressive, the Ocean Magic game that features a "Bubble Boost", which is activated with an ante wager, and the light-hearted Keystone Kops games Pie Patrol, Pilfering Pooch and Shuffle Scuffle. Spin-Splosion! is the latest slot machines 2017 to join the TournXtreme automated tournament solution family. Features are a tournament solution for hosting single or multi-site tournaments, while offering players a fun, upbeat carnival-themed experience with real-time leader boards and ongoing activity that inspires engagement. New titles will represent a mix of volatility levels for three-reel and five-reel games such as It's Raining Cash, Double Diamond Silver Anniversary, Super Silver 7s and Multipliers on Fire games. The Company's Interactive gaming capabilities are demonstrated through a series of new cross-channel innovations that span sports betting, slots, poker and bingo. The Company's Triple Play offering uses one platform to deliver new content, including in-house and licensed brands, to Play-for-Fun, Real Money gaming and PlaySpot software users. IGT's Cardless Connect systems solution enables players to enjoy slots, place sports bets, and wager on live table games on their choice of mobile devices, without the need for a physical loyalty card, TITO tickets or trips to the casino cashier. Interactive Poker and Interactive Bingo product offerings including a Wheel of Fortune bingo room and Poker Challenges, an exclusive fast-play mobile tournament game. New IGT video poker titles are Ultimate X Bonus Streak, Super Triple Play Jackpots and IGT's Multi Race Keno games, which combines Keno with traditional multi-hand game mechanics. Also, IGT has expanded Electronic Table Games for live baccarat and roulette. SG has emerged as the gigantic player in the gaming world with the acquisition of both Wms Gaming and Bally. In addition, their other branded products consist of Barcrest and Shuffle Master. At G2E, Scientific Games featured more than 200 slots and nearly 100 unique themes while showcasing new slot platforms, game content and popular consumer brands. Taking center stage in hardware innovation, Scientific Games introduced the PRIZM Game Table. This pioneeering social gaming table features a 65-inch 4K display with seating for four. Designed for community-style play, the game table supports both slot and electronic table content. TwinStar J43 gaming platform features a 43-inch curved portrait display with a cinematic, 4K Ultra High-Definition game-play experience. Exclusive content includes Dancing Drums, Heidi’s Bier Haus and Quick Hit Ultra Pays. The TwinStar 3RM is a spinning-reel cabinet highlighted by a 24-inch top screen, three reels and expanded iDeck multi-touch button panel. Exclusive content includes the 88 Fortunes, Fu Dao Le, Life of Luxury and Blazing 7s Gold themes. Spider-Man theme on the Pro Wave cabinet, featuring a three-level progressive jackpot and a wheel feature. The Godfather theme offers free spins with double the lines, a five-level progressive jackpot feature and random character symbols that award character upgrades, respins, multipliers, or more credits. The Bachelor, a game based on the hit romance reality series is a low-denomination three-reel game with a five-level progressive jackpot and six bonus features— Limousine Arrival, Rose Ceremony, Destination Date, Fantasy Suite and a spinning wheel in the shape of the iconic Bachelor engagement ring. Johnny Cash, one of the few artists ever to sell over 90 million records, entertains in a namesake game. bringing Johnny Cash's popular songs to life through concert video, the game features hits The Ring Of Fire, Walk The Line, Hey Porter, All Over Again and Cry Cry Cry. The National Lampoon’s Vacation game presents a WAP top award, free spins, a wheel bonus and two themed features — The Griswold Family Vacation Bonus and Walley World Free Spins. In The Simpsons game, players travel through Springfield with Homer, Moe, Apu, Chief Wiggum and other favorites and experience the chance at winning a life-altering WAP jackpot along with a Donut Wheel and three other bonus events. Tetris, one of the world’s most popular and recognizable video game brands features a two-level mystery must-hit jackpot and the game’s iconic “Tetriminos” that can land on or above the reel, creating expanding ways with mystery reveal symbols. Willy Wonka Dream Factory takes players on an unforgettable journey through the deliciously delightful, whimsically wonderful world of Willy Wonka & The Chocolate Factory. The HIC Hold’em game is based on the popular Hawaiian Island Creations surf-themed brand of surfboards, skateboards, clothing and accessories. Players vie to get a better five-card hand than the dealer, and the Big Kahuna side bet delivers the chance for a big prize with three-of-a-kind or better. Additionally, there is a new variation of the popular Pineapple Hold 'em poker in which players get three cards to form their best two-card starting hand. HIC Hold 'em Poker is the first version of hold 'em to incorporate the Shuffle Master i-Deal Plus shuffler into the game by randomly selecting the bet multiplier; in turn creating more excitement at the table and additional ways for players to win big. Zappit Blackjack takes blackjack to the next level by enabling the player to exchange their hand for a new hand and offering the potential for greater wins. Blazing 7s Blackjack Progressive capitalizes on the player-favorite Bally Blazing 7s slot brand to offer a blackjack progressive side bet. Lunar Poker, already a favorite in Asia, enables players to play five card draw against the house. Scientific Games introduced Prizm Game Table with Lightning Launch Roulette, an exciting new twist to a player favorite. In this entertaining new game, players launch their ball into the wheel to determine their base game winnings. Optional bonus chip wagers add a community and anticipatory element, offering players the chance to win exciting prizes and jackpots based on both the result of their ball’s spin as well as those of the other three players. SG enhances its slot machines 2017 game library with highly anticipated releases such as 88 Fortunes, Dancing in Rio, Wonder Woman Gold, Rainbow Riches Reels of Gold and more. With new innovations like portrait orientation gaming, Scientific Games continues to provide groundbreaking content and technology to the land-based and online gaming industry. Live Sports and Virtual Racing and Sports, SG’s new Live Sports Wagering Virtual Racing and Sports software and kiosk solutions are designed for casinos, racinos, and lotteries. With both kiosk and mobile-wagering opportunities, players can enjoy high-quality virtual racing and sporting events and live race and sports wagering where allowed. SG jumps right into the popular Social Games category that includes a wide variety of social, skill and/or casual games available online. SG Interactive offers enhanced SG Universe, a comprehensive, proprietary product suite featuring the Mobile Concierge platform, Play4Fun Network social casino and Core Systems Integration technology. Players receive a full suite of service, amenity and entertainment options in the palm of their hand with the Mobile Concierge app while the Play4Fun Network social casino allows players to enjoy a favorite casino game while on the go. SG Sports is an enhanced omni-channel solution for online and retail fixed odds sports betting. PlayCentral HD is a retail self-service kiosk for lottery instant and draw games and Keno. Their feature presentation for slot machines 2017 offers the all new Concerto Video Slot Lineup including Concerto SeleXion, Concerto Slant, Concerto Stack, and Concerto Crescent. The lineup reveals never-before seen skill-based, multi-station, core, and premium slots. Castlevania themed slots plus Crystal Cyclone multi-station progressive—all offer clear roots to Konami’s popular video arcade and amusement heritage. Concerto Slant: A key member of the expanded Concerto Collection, the new Concerto Slant has dual 27” HD cinematic displays consistent with the popular video upright machine, but with a lower profile and relaxed-angle posture for player comfort and convenience. Concerto SeleXion: Konami’s popular SeleXion multi-game is bringing the industry’s fastest game change speed to Concerto with expanded memory and processing power, up to 10 different games themes, and a brilliant menu interface. Concerto Crescent: Konami’s first ever curved screen is part of the expanding Concerto Collection of slot machines 2017. Beyond the stunning effect of its curved 43” HD, there is the machine’s premium debut release of Castlevania themed slots based on the classic Konami video game series and featuring the game’s iconic heroes as they venture through exciting new quests with fun slot play experiences. Concerto Stack: The Concerto Collection also includes an extra-tall 43” single screen cabinet, with 120-line games such as Dragon Fury and Pharaoh’s Fury. Similar to the Crescent, Concerto Stack features custom portrait-oriented games with new game play mechanics, original math, and bonus feature events. Frogger: Get Hoppin’: a twist on the Frogger arcade classic, the game combines piano-style button melodies with the iconic road and river crossing course, Konami’s Frogger: Get Hoppin’ skill game is a 15-second race to increasing scores and cash prizes. Beat Square: a rhythmic dexterity skill game with a nod to popular Konami arcade sensations like Dance Dance Revolution. Beat Square allows players to select song tracks and compete for top scores by tapping synchronized rhythmic patterns across a series of colorful touch buttons. Crystal Cyclone: in the spirit of Konami’s proven Titan 360 multi-station machine, Crystal Cyclone is a colorful, high-energy mechanical bonus game concept that can simultaneously connect all players to a center roulette-style progressive feature for big wins and excitement. Aristocrat presented a new mix of slot machines 2017 titles, cabinets, games and system solutions at G2E, Las Vegas. The innovation begins with three new cabinets, including a new stepper line. Aristocrat’s new Class III games include thrilling new titles Tim McGraw, Sharknado, My Cousin Vinny, Dragon Link, Wonder 4 Wonder Wheel, Quick Fire Flaming Jackpots and Spin It Grand. VGT will showcase a new platform, Ovation that brings player-favorite Aristocrat content to the Class II space, combining market-proven brands with field-proven math models and comes to market with seven strong titles and a roadmap to expand the library. In systems solutions, Aristocrat’s Oasis 360 Brand Connectivity Suite can help operators increase customer interaction with a range of integrated solutions. Weird, Wicked and Wild is a novel take on the standalone progressive mechanic, with a variety of free game features and a grand mystery prize that will drive players wild. Weird gives players 13 free games, with the opportunity to multiply wins by one, two, three or 10. Based on the hit TV series from FX, the Sons of Anarchy slot game introduces a totally new and innovative way for players to win with Cluster Power. Cluster Power creates winning combinations by connecting the same symbol in clusters across multiple reels. No limits, big symbols and a $500,000 jackpot add to the excitement. Includes favorite TV characters like Jax, Gemma, Opie Clay and Tara. The Walking Dead II Slot Game is heavily themed to the action in the show’s seasons III and IV. This game entry for slot machines 2017 includes the features Michonne Attack, Reel Growth, and Wild Horde. Exciting bonus features include Governor Jackpot Bonus and Governor Free Games. Player’s Choice Gold Jackpots is a multigame that combines six standalone progressive games in one pack each with their own unique symbol-driven jackpot triggers. The game offers flexible configurations, giving the option to display all six games, three low-denomination or three high-denomination games. Lightning Link is an electrifying set of linked games that are sure to be a hit on the casino or gaming floor. It’s Aristocrat’s first progressive range with player selectable multi-denomination. The innovative Hold & Spin Feature will have you on the edge of your seat waiting for multiple bonuses and progressives to strike. With exciting Free Games Features, Lightning Link has something for everyone. Batman Classic TV Series has all the POW! of a progressive with the BAM! of one of the hottest titles ever to hit the casino floor. Batman and Robin will send your players spinning through the Rogue’s Gallery of iconic villains: The Joker, Catwoman and The Riddler. Now it’s time for you to explore the 2017 Slots Playground at your next casino stop online or off. New Slot Machines 2017 preview at gamerisms is a yearly report about new slot and table games/titles.